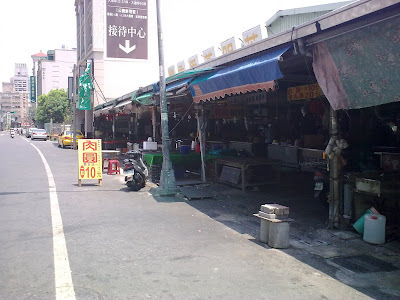 This is the second best Taiwanese meat dumpling, and the best in Kaohsiung. It is freaking cheap. Super great ROI. Tradition: Taiwanese these days are NUTS about cutting down the dosage of salt. This vendor's broth is salt free. Althoght Lin-Yuan is better, but the difference does not justify the trip. On the other hand, if it is on my way, then I cannot miss it. It costs only NTD$10 for a piece for such a delicious treat. Further more, buy five get one free! Gosh! Where else can you find such a great deal? The boss is making a new sign. If you cannot find this one, try to find "港都肉圓專賣店".